Detroit show car hints at expanded line-up of battery-electric vehicles. 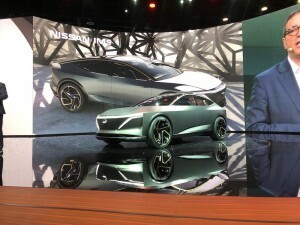 Nissan's IMs concept hits the Detroit Auto Show just after the company rolled out its longest-range Leaf ever. The concept vehicle debuting at the North American International Auto Show pushes the envelope when it comes to three key trends: the shift from sedans and coupes to SUVs and CUVs. It also features a pure BEV drivetrain, a technology Nissan promises will dominate its line-up moving forward. The show car also adds autonomous driving capabilities. Add them together and, Nissan suggests, its future models will feature a distinctly different approach to design, as well. The Jaguar I-Pace already demonstrated what you can do by moving your batteries, motors and other components under the vehicle’s load floor, allowing for a cabin far bigger than what the exterior footprint might suggest. The Nissan IMs goes a significant step further, with its stretched wheelbase allowing for an unusual “2+1+2 seating arrangement.” The front seats can be pivoted when the car is operated in autonomous mode, turning the cabin into a mobile living room. 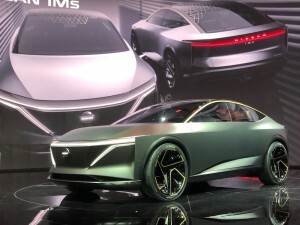 Nissan's IMs concept offers creative implementation of autonomous technology as well as battery-electric propulsion. No surprise, the IMs sits higher up than a typical sedan, reflecting the surge in sales of utility vehicles, but it aims to retain a more sporty feel. Nissan was one of the first automakers to embrace the idea of autonomous driving, and has been steadily increasing the capabilities of its production models with technologies like the ProPilot Assist found in vehicles such as the new Leaf Plus. The Nissan IMs concept reaches further into the future, to a time when a driver could switch to completely hands-free operation – but it also offers the opportunity to return to manual driving, as well. The Leaf was the world’s first high-volume battery-electric vehicle and has remained the best-selling BEV on the planet, though it is facing growing competition from the likes of the Tesla Model 3, Chevrolet Bolt EV and other new entrants. We can expect to see even more coming from the Japanese automaker as it pushes to regain its momentum, promised Denis Le Vot, the head of Nissan North America. The IMs features dual electric motors, one on each axle, drawing power from a 115 kilowatt-hour lithium-ion battery pack. That’s enough to not only deliver an estimated range of 380 miles but also a truly sporty driving experience, with 483 horsepower and 590 pound-feet of essentially instant-on torque. The battery is capable of using new fast-charging technology that should sharply reduce the time it needs to be plugged in. While many of the features on the Nissan IMs are still years away from reality, others are “ready for launch,” the automaker suggests. Expect to see the new design approach, in particular, work its way into production as Nissan expands its battery-electric vehicle line-up over the next few years. This entry was posted on Monday, January 14th, 2019 at and is filed under Advertising, Auto Shows, Automakers, Automobiles, Autonomous Driving, Business, Concept Cars, Crossovers/CUVs, Designers, Detroit, Driverless Vehicles, EVs, Electrified Vehicles, Executives, Markets, Nissan, Personalities, SUVs, Sales, Technology, U.S./North America. You can follow any responses to this entry through the RSS 2.0 feed. Both comments and pings are currently closed.